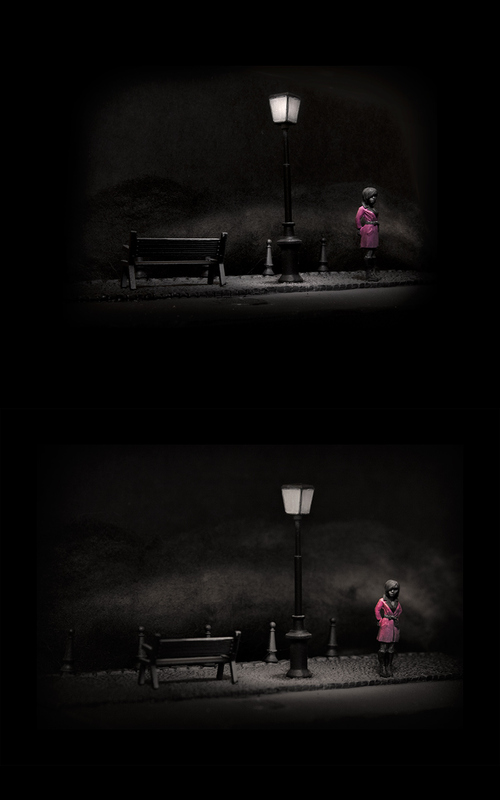 my little vignette did pretty well — out of some 70 entries it placed 18th I think. It currently has a ranking of 8.1, which I am pretty happy with considering it was a pretty simple entry. 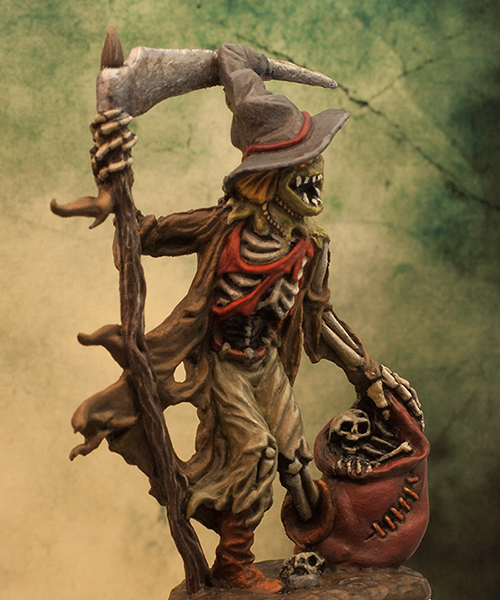 The people over at Wyrd Miniatures is having a contest – the Iron Painter. It is a direct elimination contest with five rounds. I think they ended up with quite a bit more contestants than they had planned – there were 228 people who signed up. The first round has been completed. The theme for the round was “Fool’s Gold”. 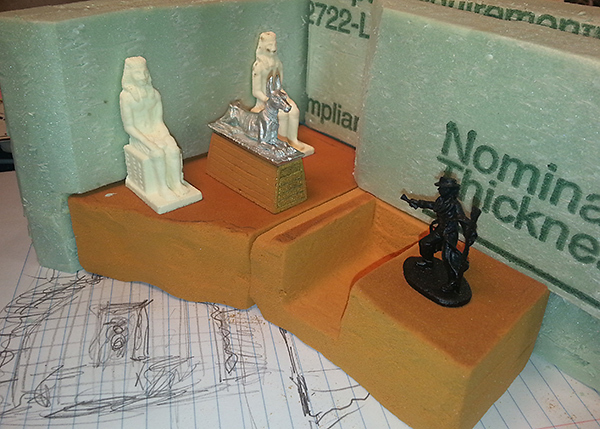 I made a little diorama with a treasure hunter in an egyptian tomb. 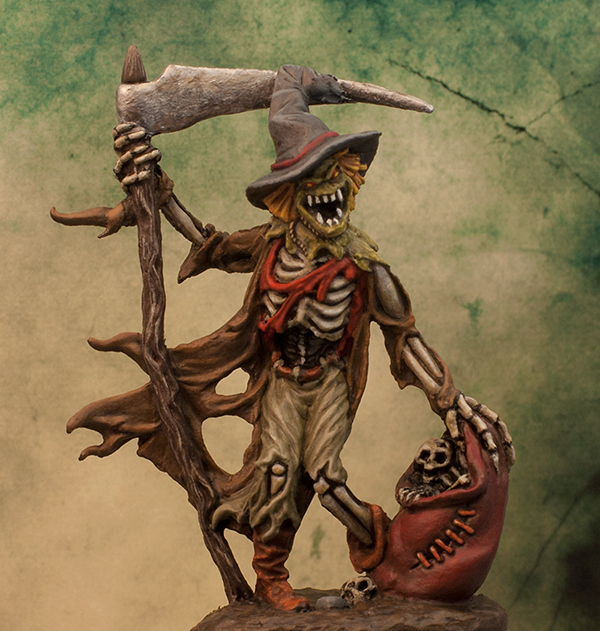 The adventurer and the mummy are both Reaper bones. 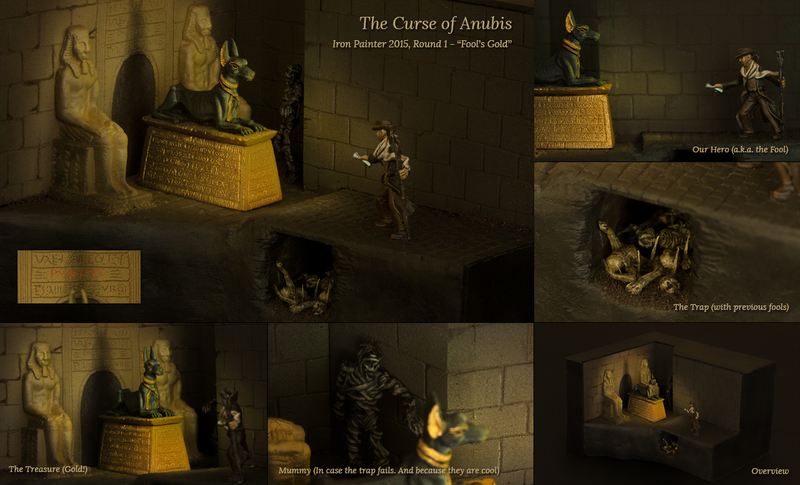 The anubis is a reaper metal figure. 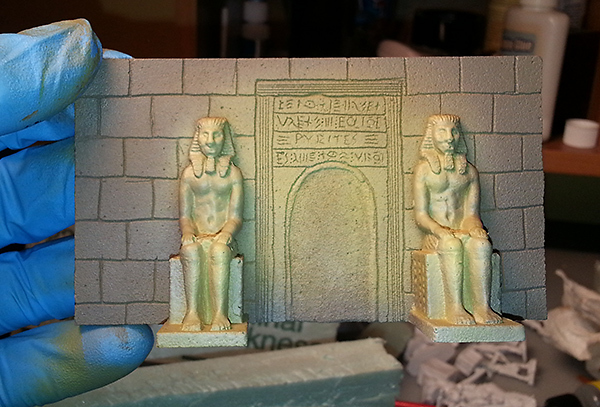 The two egyptian statues are by a company called Itar’s Workshop. My entry did pretty well. There were a bit of confusion, as my opponent never submitted an entry. According to the rules I would be matched up against someone else instead, but somehow my name didn’t make it to that list. So I ended up without an opponent. This made it pretty easy for me to advance to the next round. But then again, my entry had the highest score in the round (54 out of 60) so I guess it didn’t really matter who I was up against. Back in mid February Cool Mini or Not announced a new contest called All the Shades of Grey. The criteria for the contest is to paint a figure using a very limited palette. I didn’t have any good ideas for it, so I wasn’t planning on entering. 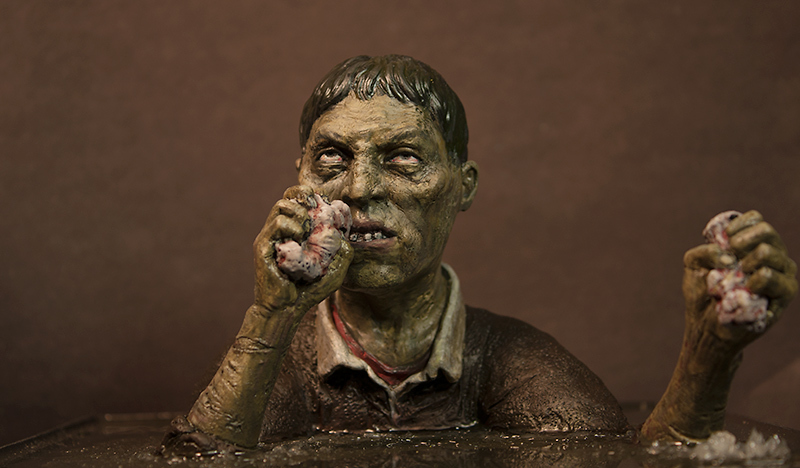 But then as I was looking through some of the new Bones 2 figures a couple of days ago, I had an idea. The figure is a female spy, and I was thinking it would work well in some sort of film noir setting with one highlight color. I only wish I had thought of it earlier, so I had more than one day to work on it. 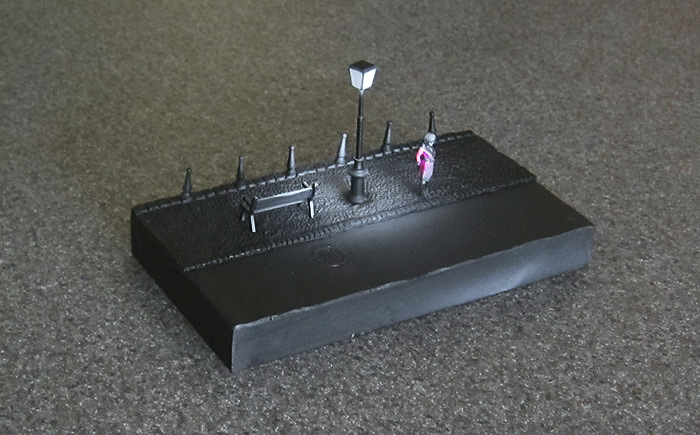 I was going to build the scenery from scratch, but then I remembered I had a box of ‘Urban Accessories’ by Italieri. 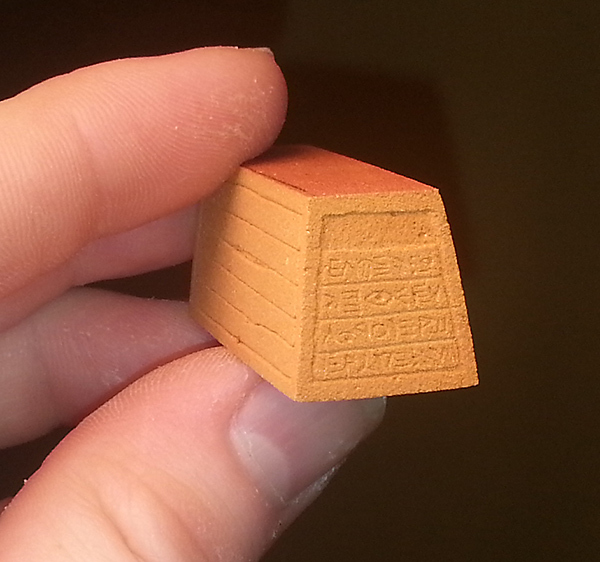 It’s 1/72 scale so it really is a bit too small, but the figure is on the small side, so I though it would work ok. 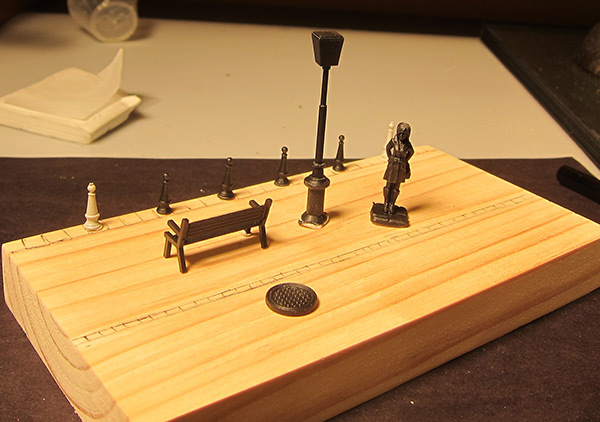 The kit had street lamps benches and a few other small things. 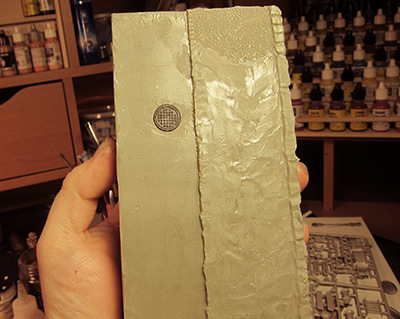 I did some things friday night – cut a piece of wood to size, primed the figures etc. 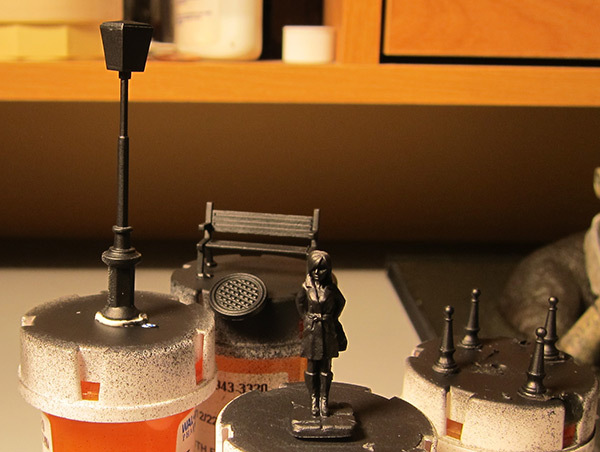 The figure is “Agatha Fox, Female Spy” and it was part of the core set of the Reaper Bones 2 kickstarter. It didn’t turn out quite the way I had envisioned it in my head before I started. I guess it never does. I wanted some mist in the scene as well, but I found it hard to make realistic mist in this scale. I tried some cotton and acrylic stuffing, as well as dog fur and some raw wool. None of it really looked good. In the end, I sprayed some black and grey color on some wool, and put that in the background. Now that I look at it, I think I need to make the collar pink as well on the figure, and I probably ought to lighten up the face quite a bit. All-in-all I only worked for this a few hours, so spending some more time of the details might help. I was also thinking of adding some sort of chains in between the metal columns in the back, to make it feel more like a sidewalk by the water. 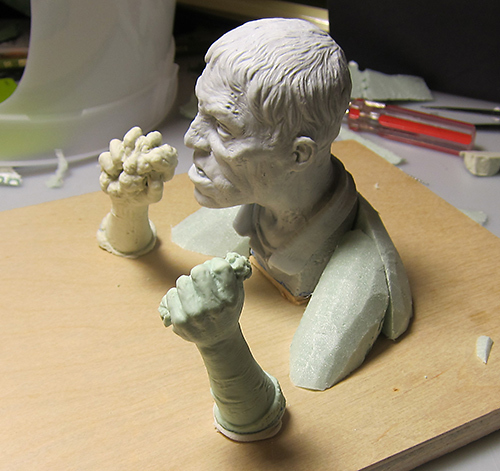 I have made a bit of progress on the Zombie. I primed it dark, and for the water, I painted it a dark green/grey. 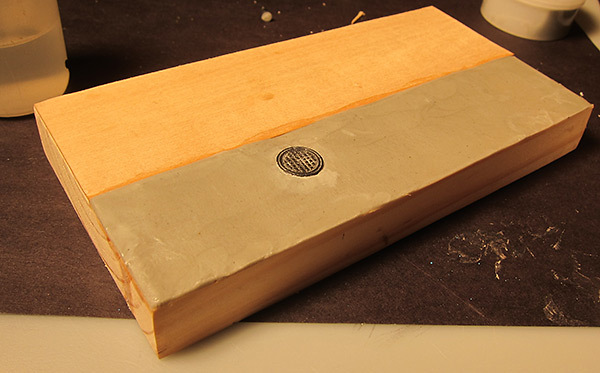 I then filled the base with about 1/16″ of epoxy. This was my first time using epoxy. It didn’t turn out quite the way I had expected, but not too bad. 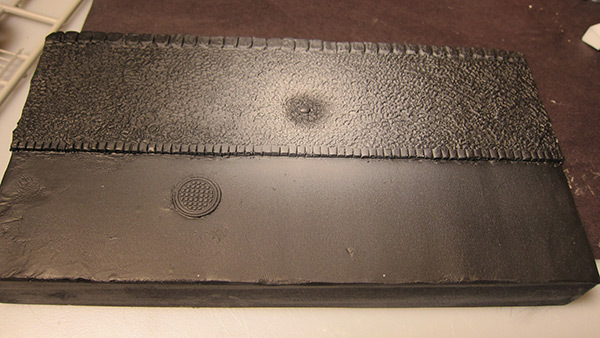 I added some wash to the epoxy to make it darker, but I don’t think it made much difference. I will need to add quite a bit more color next time. I am using Woodland Scenics water effect to create some ripples around the body. Again, this is the first time using this, and it will take some practice to get it right. I notice that it looks a bit odd now when some of the surface is completely mirror-flat, then just around the body there are ripples. I think I will cover the whole surface with a little bit of texture. 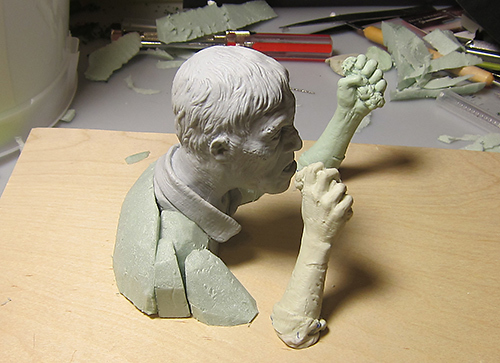 My plan is to build up the water under his right hand so it looks like he just lifted the arm up from under the water. The water effect is taking a long time to dry though, and that part is still not completely transparent. Of course, I am planning on adding some highlights to this anyway, to simulate foam/and light, so that might not be so big a problem. The skin is about half-way done, I would guess. I think it looks a little bit too even green right now, so I will try to lighten it, and add some blotches. 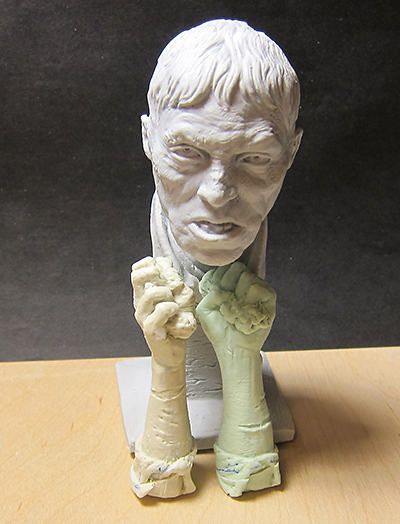 During a christmas party in the figure painting group I am in, I received this bust from Kirk Kirkland of Collapse Industries (thank you!). 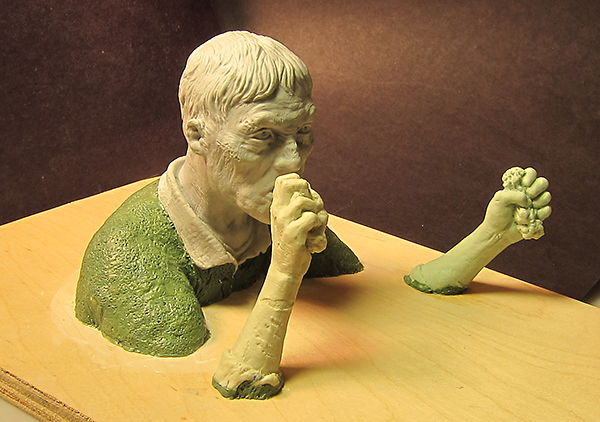 It’s a zombie with detached arms holding a brain. 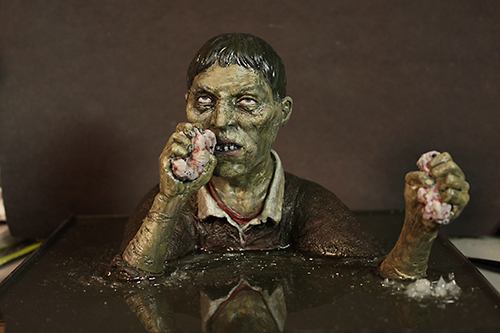 While I was figuring out how to position the hands in relation to the head, my wife suggested that I could put him in water when just his head and hands sticking up. I though that sounded like a great idea, so that’s what I am going with. 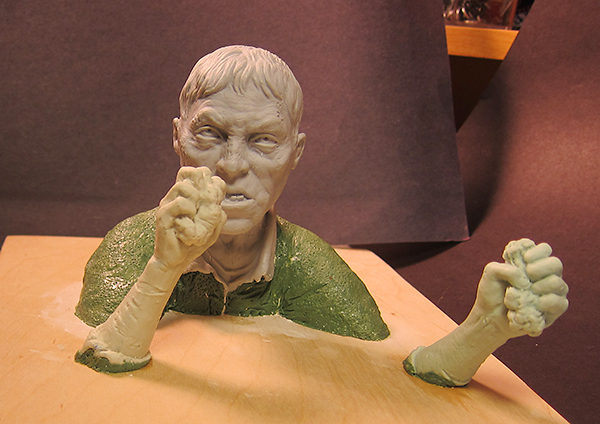 I decided I needed to sculpt some shoulders to make this work. 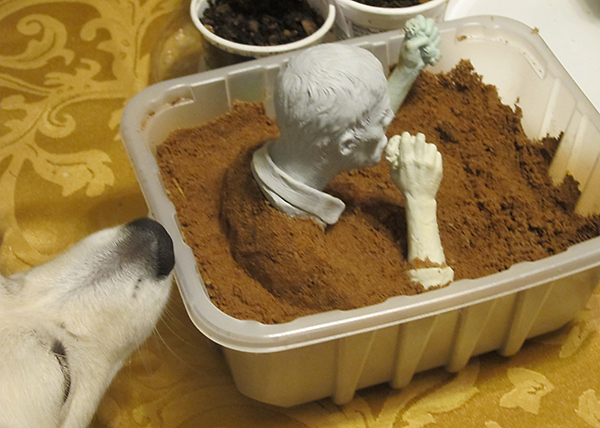 To get a rough idea for how to do this, I used some sand. Once I had worked out approximately how I wanted everything positioned, I cut the base of the bust, and mounted into a board. I cut some foam into the rough shape of the shoulders. 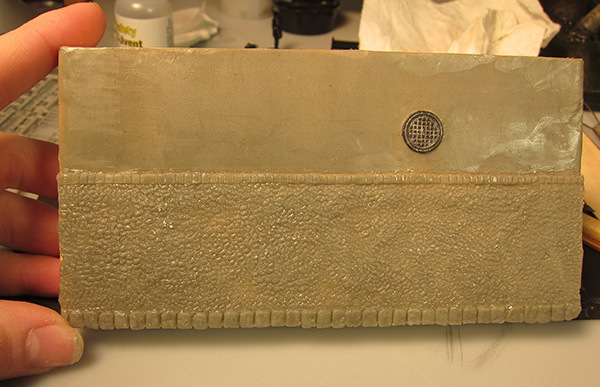 I proceeded to cover the foam with a layer of milliput. The surface of this got kind of lumpy, so I finished it with a thin layer of green stuff. This is where I am right now. Next I’ll see if i need to fix anything or add additional details, then I will prime and start painting. 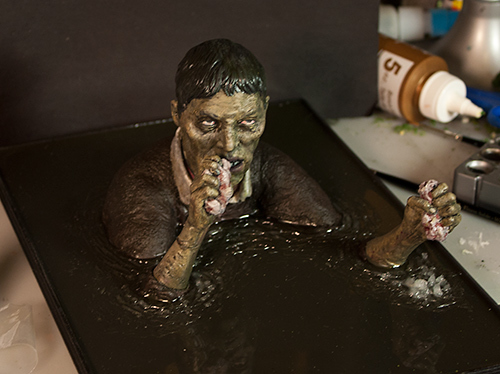 I also need to work out how I want to make the surface of the ‘water’ around him. I was planning for the water to be dark, so not much see-through. 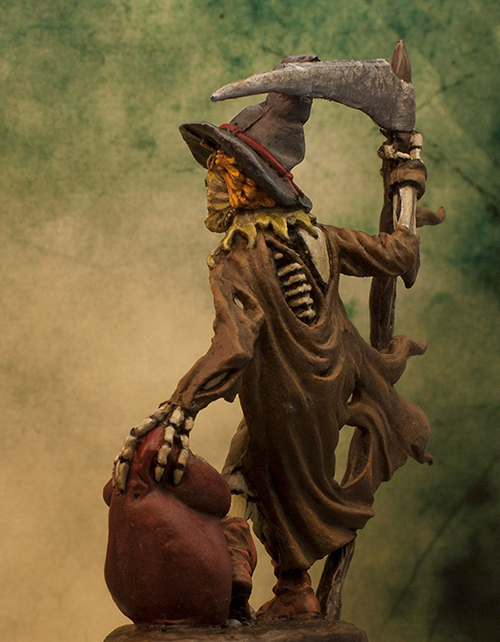 I’ve finally had the time to go through all the figures from the Reaper Bones II Kickstarter. In got about 250 figures in total! It was hard to pick which Bones figure to start with, but in the end I picked Gauntfield the Golem. Actually, he looks like some sort of skeleton scarecrow. This figure is a little bit larger than many of the other Bones figures. It was fun painting it, though a little bit tricky to work out what was what in his folds of fabric. 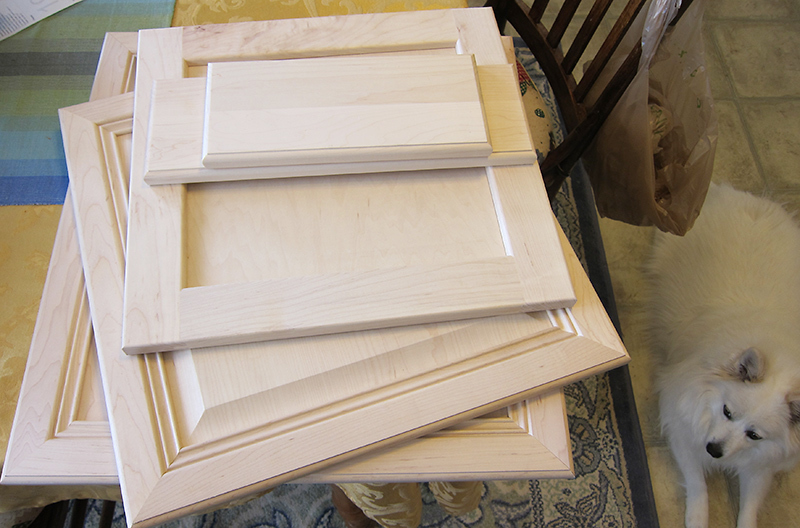 I stopped by a local outlet recently, and they had unfinished cabinet doors for sale. I thought they looked like excellent bases for building dioramas. So I bought several of them. 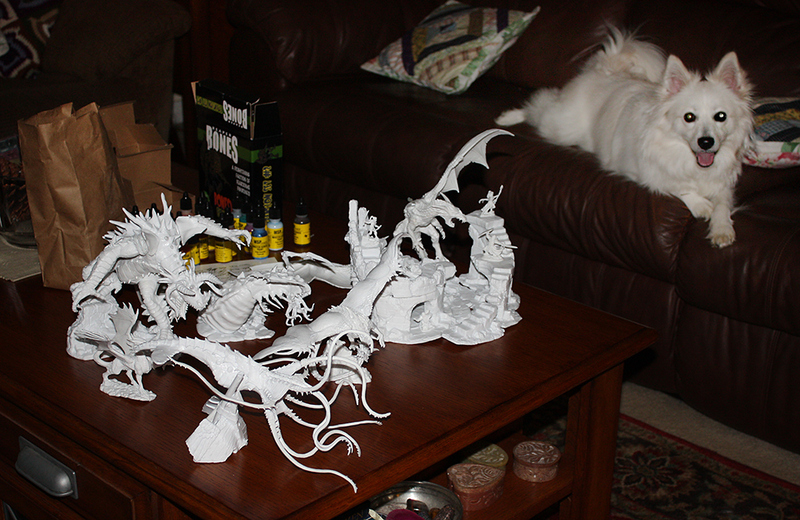 I think the largest ones will work good for a 1/72 scale diorama I have already started painting the figures for. 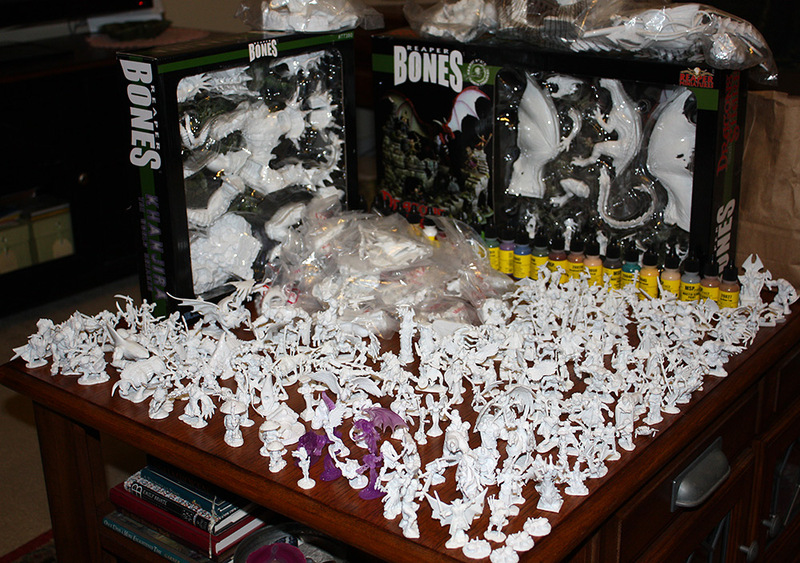 I supported the Bones II kickstarter, last year, and they were finally delivered! They were supposed to be sent out back in September, but they got some delays. 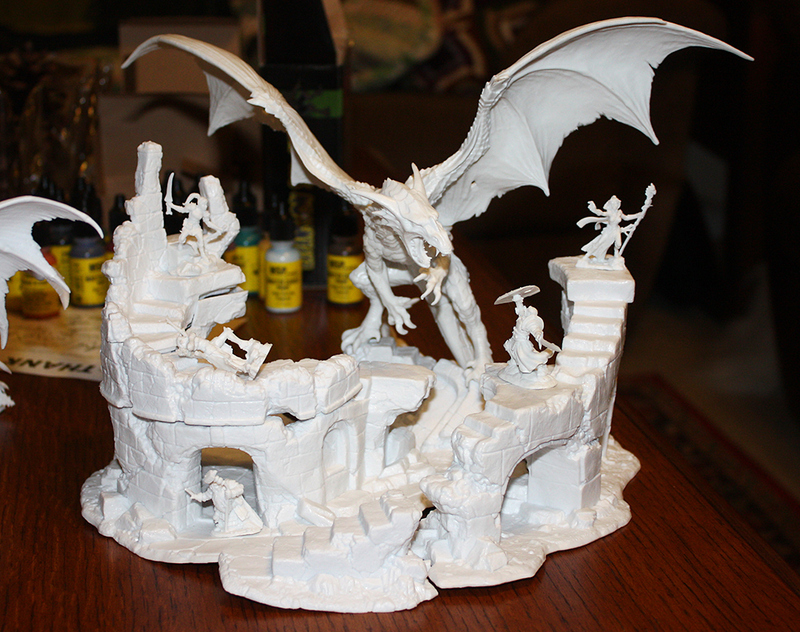 I pledged for most of the figures, except a more sci-fi themed add-on, and a few dragons. I am still going through them all, but they look great. 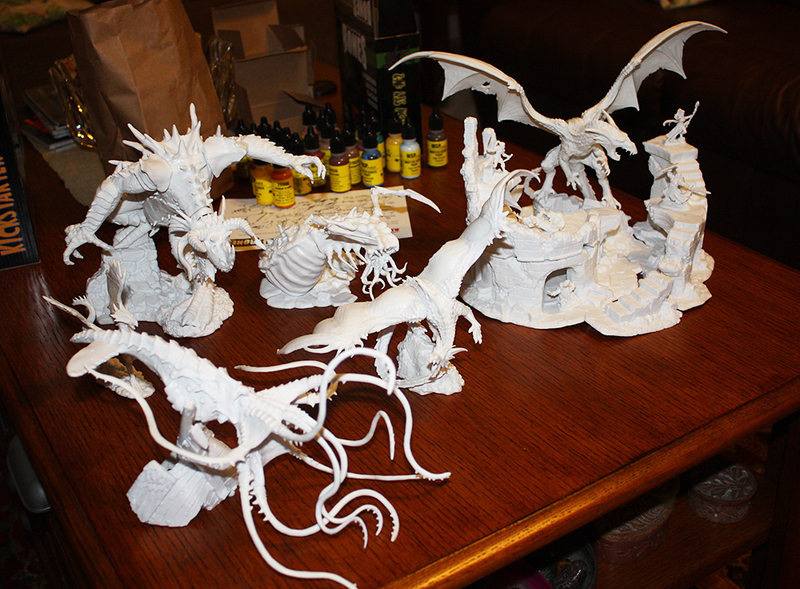 This should be enough figures to keep me busy for years, if I wanted to paint them all! I’ve started my first figure from the Darksword Kickstarter. It was hard to decide what to work on first. 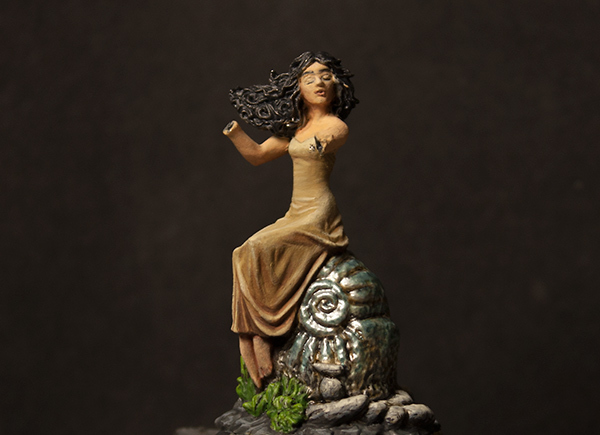 This is Euterpe, one of the Muses. She is playing a flute, but I have not attached the arms yet, so right now it looks a bit odd. At first I made her eye look straight forward, but when I held up the flute in from of her face, that looked weird. Now I have her looking down instead. 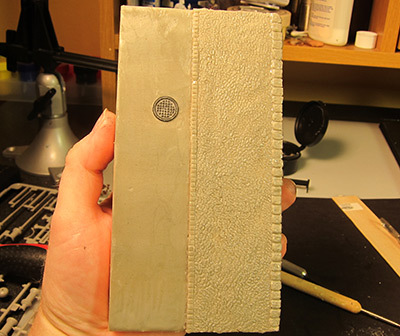 It looks a bit odd, but I am hoping it will look better with the flute attached. I also think I need to move the eyebrows down a bit.